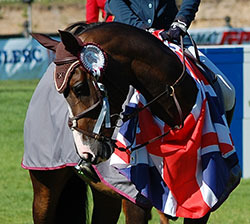 The final dressage medals were awarded for the Kur. This is a freestyle to music competition where the riders have to include a list of compulsory movements but they can be performed in any order so riders can choose their own floor pattern as well as music to enhance their pony's performance. There were two British riders through to this class and Phoebe Peters & SL Lucci (Lukas x Bazar) were drawn to go in first. Sadly for Phoebe, Lucci had been quite spooky in the warm up and this left him tense in the test and he also spooked again. However, her floor plan was interesting and her music (classic Western themes) fitted both the floor pattern and Lucci's paces very well. As a result, she got 70.525% and finished 14th. As Phoebe is only 13, she is still eligible for the Pony Euros next year and the experience she has gained this year should stand her in good stead for future years. 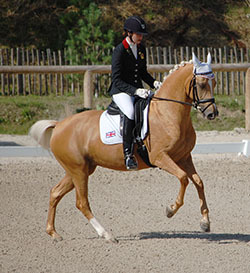 The other GB combination through to this stage were Erin Williams & Dynasty (DRP; Deinhard B x Arts-Dancer-Boy). Erin had chosen Disney music, including tunes from The Lion King and Jungle book and it worked well, suiting Dynasty's flowing movement. Erin was pleased with her test and the judges average score of 74.90% gave her 7th place and the best result for a GB dressage pony at the event. Erin is also young enough to compete as a Pony Rider again next year, but she also has a lovely horse and has already been getting very high scores on her in Junior classes (including winning at the Addington CDI in April) so she may well elect to compete at the Junior European Championships next year instead. The best ponies and riders in the Individual Test went at the end of the class and scores climbed with the 12th combination, Sanne Vos (NED) & TC Champ of Class DVB, being the first to breach the 80% mark, scoring 81.750%. However, they only had the lead for a short while as the last pair to go, Semmieke Rothenberger (GER) & Golden Girl scored 81.750%. The scores were so close that 3 of the 5 judges actually had Sanne as their winner but high scores from the judges at E (from Slovenia) and B (from Germany) put Semmieke ahead, reversing their positions in the Individual Championship. 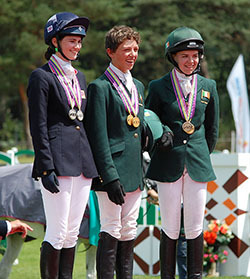 The Bronze medal winners, Rosalie Bos (NED) & Paso Double also won Bronze in the Individual test. 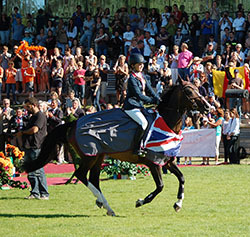 The first challenge for the Eventing competitors on the final day was the trot up. 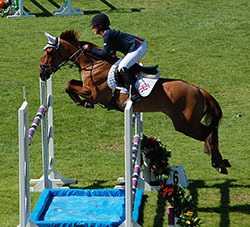 Sadly for Team GB, Charlotte Bacon withdrew Three Wells Breeze at it. As they had been in 14th place overnight, this was disappointing for both Charlotte and the team as Madeleine Taylor & Bandelera's higher score now had to be included in the team score. 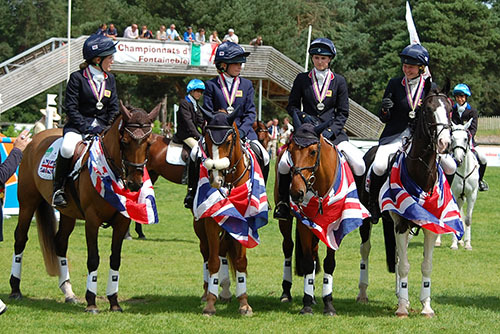 However, the gap in scores before the next team was large enough that GB remained in Silver medal position but with only 4 fences in hand ahead of Holland. So the pressure was on the remaining 3 team members to produce clear rounds and maintain the Silver medal position. Just an hour after the trot up finished, the Jumping phase started. Course designer Jean Claude Quque used the undulating ground in the main arena to good effect when planning the course and of the 41 riders through to this stage, just 11 went clear and all moved up the order as a result. With the riders going in reverse score order, GB's first representatives were Yasmin Ingham & Craig Mor Tom (breeding not recorded) who had an overnight score of 68.3 due to refusals at Fences 3B and 18A (the drop in to the second water) on the cross country. Unfortunately, Craig Mor Tom had 4 faults at fence 5 but as other riders had significantly more faults, she still moved up from 39th to 36th place. Yasmin, Charlotte and Annie Keir (who was eliminated on the XC) are all young enough to be eligible for the Pony Team again next year so, hopefully, they'll be back and have better luck next year. Madeleine Taylor & Bandalera (Welsh PB; Ski Dancer x Corston Comet) were the first of the GB team riders to jump and although 16 riders had already jumped, there had only been 3 clear rounds. Maddie & Bandalera soon increased this total with a lovely clear round within the time allowed. Maddie is 16 this year, so will move onto horses, but she's planning to keep Bandalera and is hoping to put her in foal next year. 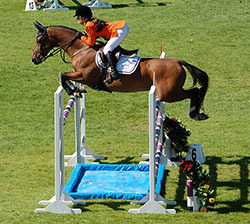 Eighteen competitors for other nations then jumped before it was Janou Bleekman & Cregann Scenic's turn. Still on their dressage score after a fantastic XC clear within the time and lying in 6th place overnight, hopes were high for a clear as that would put pressure on the riders ahead. All was going to plan until the penultimate fence fell and Janou & Cregann Scenic finished on a score of 53.8 in 7th place. Eight faults followed for Lucy Latta (IRL) & the Dutch New Forest Pony, Nono, dropping them right down from 5th to 10th place, but the Irish team's lead going into the Jumping was so great that her faults were not expected to stop them from winning Team Gold. Then it was the turn of Louisia Nesbitt with Carrowmore Gemstone. 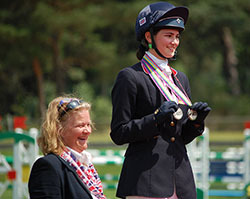 First to go for GB in both the dressage and eventing and in 4th place overnight, Louisa knew that a clear round would put the pressure on the last 3 riders. Louisa, who said afterwards that before the competition she had dared to dream of a good result but hadn't expected anything, rode a fantastic clear round to finish on her dressage score. 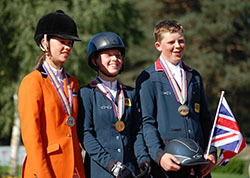 With the Team Silver medal secured for GB, it was still all eyes on the last three riders, even though Louisa was 8.4 penalties behind the overnight leaders, Leoni Leuwer (GER) & Camissa Nera and when 3rd placed Cathal Daniels & Master Murrose went clear, an individual medal looked unlikely. 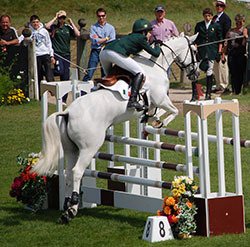 Ana O'Brien was the last of the Irish riders to jump and needed to go clear to maintain their Silver place. 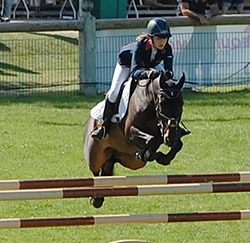 However, they had 2 fences down, and dropped behind Louisa, who moved up into Bronze medal position. The final rider to jump was Leoni Leuwer who with her German Riding Pony, Camissa Nera, had led the competition since her 72.91% dressage test on Thursday. 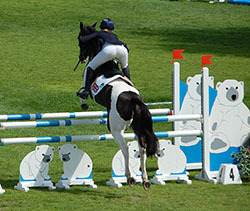 With a fence in hand, a medal of some sort looked a certainty for Leoni, who was competing as an individual for Germany. However, this was not to be as they had 3 fences down and dropped to 5th place, with Louisa rising to Silver medal position, Ana to Bronze and Carla Lefaure & Kisaute HO d'Othon being rewarded for jumping a clear round and rising from 7th to 4th. Despite the 8 faults apiece for Ireland's Ana and Lucy, they still won the Team Gold, finishing 25.9 penalties ahead of GB, who took the Silver. 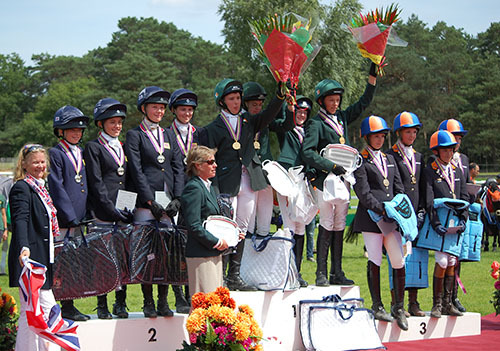 Holland kept ahead of Italy so won the Bronze, and the French team finished 5th. At the press conference after the medal ceremony, Cathal described 16 year old Master Murrose, who has been with his family for 11 years, as "a legend" and a Cross Country machine. Master Murrose took Cathal's eldest sister to the Rome Pony Euros, did Pony Club with his next sister and, as this is Cathal's last year in ponies, is being passed on to his 13 year old sister next. When asked what he was expecting at his first Pony Euros, Cathal said that, while he knew they were a strong team and they had all been practising hard with dressage coach Sue Smallman to improve that phase over the winter, he'd definitely not expected double Gold! Son of a past international eventer, Cathal has a young horse that he hopes will be ready to do The Young Rider Euros in a few years. Louisa said that the GB team had thought that although the XC course was inviting, it was also going to be testing. Team orders were to play safe and go the long way at the first water complex and this had also been the tactics of the Irish team, whose Chef d'Equipe had calculated that the 5 seconds more it took meant that it wasn't worth the risk. As Louisa is 16 this year, she moves onto horses, and has one already, with Carrowmore Gemstone moving to her 14 year old sister who will just get the one year in ponies to attempt to beat Louisa! Ana was complimented at the press conference on the improvement in Ice Cool Bailey's dressage score and she said that last year he'd been spooked by the wind during his test but they too had worked hard over the winter with the team coach. Ice Cool Bailey was already one of the all time top eventing ponies and his results this year have just added to his accolades. Although Ana is too old for ponies next year, Bailey will be staying with the family as she has a younger brother to take over. 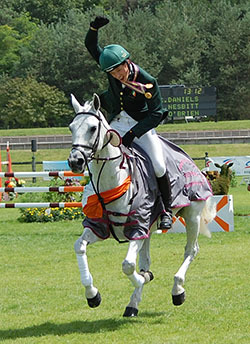 When asked if their ponies were all Irish-bred, the Irish Chef d'Equipe laughed and said that just Master Murrose and Ice Cool Bailey were - but she added that as Carrowmore Gemstone was Irish-bred, then they did have a clean sweep of individual medallist winning ponies!! 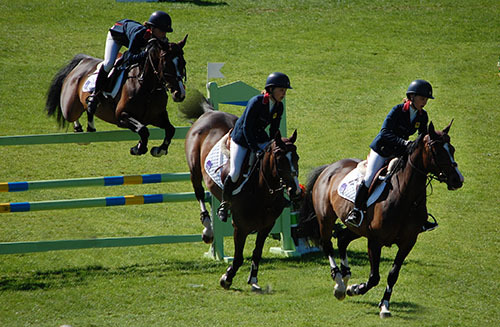 All of the British Jumping riders went through to the two round Jumping Individual Final. Scores are carried forward from previous rounds and only GB's Millie Allen & Song Girl and Germany's Marie Schulze Topphof & Mentos Junior 2 went through with zero faults. 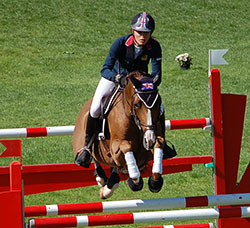 The other British riders carried through 4 faults (Amy Inglis & Jessica Mendoza) or 8 faults (Beth Adams & Alex Chitty). The first round had 12 obstacles and 15 jumping efforts over 450m. The water was included and the course builder again used the undulating ground of the main ring to create a challenging course. 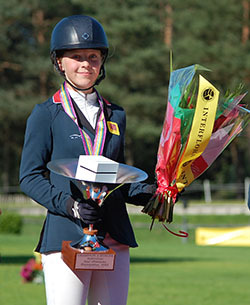 Riders went in reverse order of merit, but even with the early riders having had higher faults in previous rounds, the fourth rider to go, Antonia Petterson Haggst (SWE) was the first to go clear and overall 50% of the riders went clear. Excitingly, this included all 5 of the British riders - and as Marie Schulze Topphof had the penultimate fence down, Millie Allen went into the second round in the lead as the only rider still on zero faults. Amy & Jessica were in equal second (along with 2 other riders with 4 faults) and Beth & Alex in equal seventh place (with 5 other riders on 8 faults). 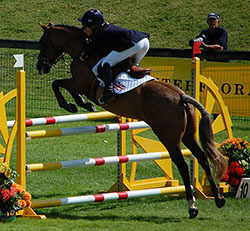 The second round course was slightly shorter, with 10 obstacles and 13 jumping efforts, but the course included a treble consisting of a triple bar to two uprights. The course designer, Jean Claude Quque, said afterwards that he had started designing the course 6 months in advance and he had then kept visiting the site to analyse the ground and use it to best effect. He also looked at the level of riders in the first individual qualifying round to make sure he got the level right. He wanted to make the riders think rather than over challenge the ponies so that no-one got hurt and, as this was achieved, he was pleased with the result. He also aimed to change the style of the course for the Individual Final from how it had been for the Team Competition so that anyone trying to second guess him would not succeed! Again, the riders went in reverse order of scores and it was quickly apparent that the course was causing more problems. Of the first 18 riders to go, 3 were eliminated, at least 8 had time faults and only one rider, Germany's Philip Houston with Caspar, cleared all the fences but they incurred one time fault doing this. The first British rider, Beth Adams' mare, Some Like it Hot then caused a slight delay when she stopped just inside the ring determined to have a wee before jumping!! Perhaps this unsettled them, as they'd barely got started when the mare stopped at fence 4A and, although they jumped it second time and completed their round without further incident, they incurred 3 time penalties on top of the 4 faults. This gave them a total of 15 faults over all the rounds and they finished 11th. The next rider after Beth, Emilie Paillot (SUI) and Top Jezebel de l'Etape (Randcho x Besbes) then achieved the first clear round of the competition, to cheers from the crowd, and went into the lead, staying on the 8 faults that had already accumulated. 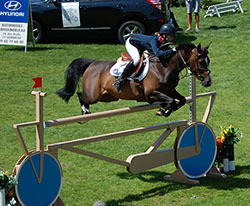 Excitingly, the following rider, GB's Alex Chitty & Amilie JR Z, also went clear and joined Emilie in the lead. Fences down for the next 2 riders dropped them down the order, then Lisa Noorden went for a steady clear, incurring one time fault with the British-bred gelding, Rock Dee Jay to take the lead on 7 faults. The next competitor, Leonie Peeters (BEL) was the first of the group on four faults, so could have taken the lead but 9 faults put them down the order. Disappointment followed for Jessica Mendoza & Tixylix when they also stopped at fence 4A before jumping the rest of the course clear, finishing with 4 jumping and 4 time faults and a final score of 12 faults and they finished in equal 5th place. British hopes were high as Amy Inglis & Nils d'Hurl'Vent entered the ring next but 3 fences down added to the 4 faults they'd brought forward had them on 16 faults and they finished in 12th, just behind Beth & Some Like it Hot. At this point, with just two left to jump, Alex Chitty was still joint second on 8 faults and the British-bred pony, Rock Dee Jay was in the lead on 7 faults. Marie Schulze Topphof (GER) & Mentos Junior 2 (Mentos x Downland Folklore)had picked up just 4 faults over the previous rounds and a clear would have put pressure on the leaders, GB's Millie Allen & Song Girl. 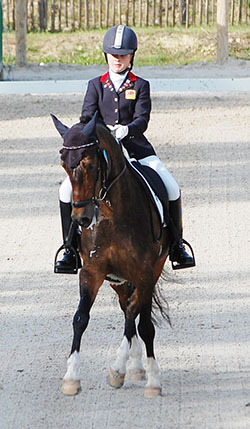 This was not to be as Marie & Mentos Junior accumulated 9 faults and dropped down the order to equal 8th. As a result, Millie & Song Girl had a fence in hand and they used this "life" in the treble, having the top rail of the middle element down. Tension mounted in the packed stands as they turned to the last two jumps. However, they cleared both in style and left the arena to huge applause. Silver went to Lisa Noorden & Rock Dee Jay but with both Emilie Paillot (SUI) and Top Jezebel de l'Etape & GB's Alex Chitty and Amilie JR Z having 8 faults, a jump off was required for the Bronze medal. The jump off course consisted of 7 jumping efforts and included a double and spread that had not been on the previous course. Lisa was first to jump and, attempting a fast clear, had a fence down. This took the pressure off Alex and Amilie JR Z jumped a lovely clear round for him to win the Bronze medal. When no one else jumped two clear rounds, that Alex & Amilie achieved three shows how well they performed. Afterwards, Millie was asked how nervous she'd been going in to the final round and she confessed to being very nervous before entering the ring, but had been able to concentrate once in and even when she'd had the fence down, she'd managed to keep cool and keep going. Millie also said that the undulating ground made it very different to other shows and that she thought that the hardest parts of the course were the big oxers going up hill and high verticals. Millie, who at age 14 has another year on ponies, has had Song Girl since the mare was 5 and has brought her on herself over the last four years. 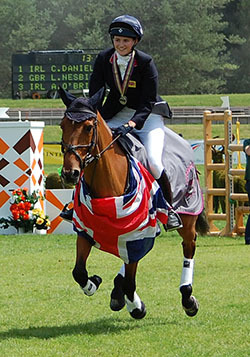 Lisa, in contrast, has only been riding Rock Dee Jay for less than a year as he was a key member of the 2011 Silver medal winning Irish team and then finished 11th individually ridden by Max O'Reilly Hyland. Rock Dee Jay (Arko III x unknown) was bred by Sharon Quigley and is out of Sharon's now deceased Grand Prix mare, Dee Jays Rio Grande. 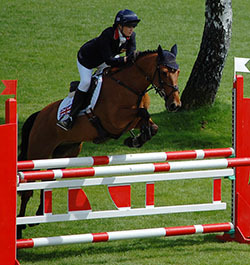 Lisa's main concern on the courses was the last fence as she knew that she had to maintain her concentration to clear that and not relax too early. Her aim going into today had been to get two clear rounds, even if she was a bit slow and, apart from the one time fault in the second round, she'd achieved this. Like Millie, Lisa admitted to getting stressed before her round but was okay once she got into the ring. 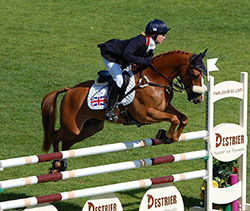 Alex described winning Bronze, having gone into the final day with 8 faults, as "surreal". 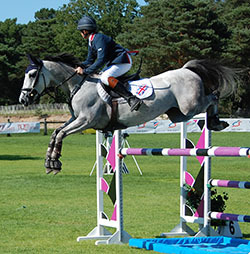 This was Alex's first and last Pony Euros as he is too old next year and he had looked at the Individual competition as a learning experience as it gave him the chance to jump large courses on the uneven ground. 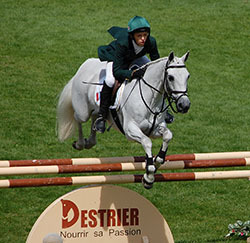 Amilie started jumping big competitions 2 seasons ago. Alex's main concern in the final round was the combination as Amilie has a big stride. British Chef d'Equipe, Katrina Moore, was delighted to win Gold and Bronze Individual medals as well as team Gold for the second year running. The President of the Ground Jury, Lena Levidis, said how pleased she'd been with the good sportsmanship shown and how the riders had "respected" their ponies, as well as with the quality of the riders and ponies. Overall, it was reported that there had been over 15,000 spectators and more then 150,000 connections to the internet site to view the live video streaming. There was unanimous praise for the venue and organisation from all the riders and Chef d'Equipes. Millie Allen with some of the prizes - she also won a tack trunk and a GPA hat.